I thought I’d better give a little recap of our whirlwind trip to Italy before it all becomes a very pleasant, but distant memory. 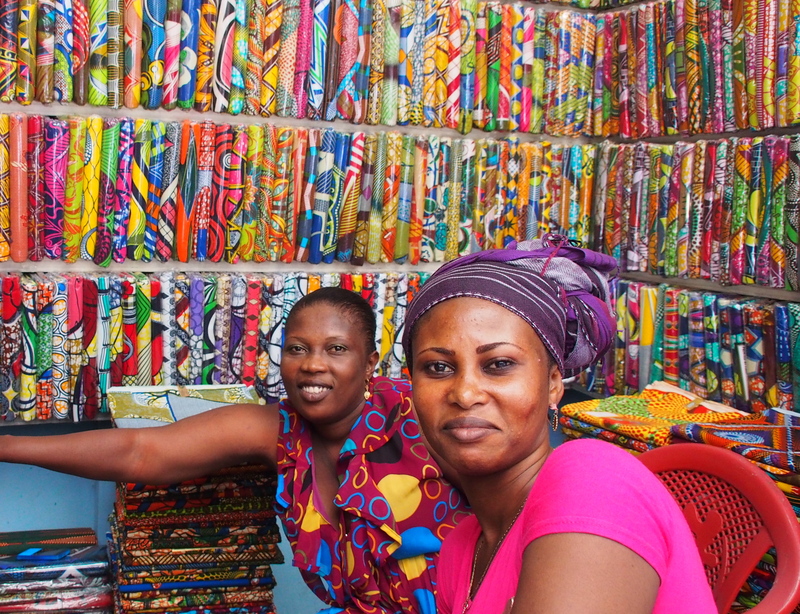 Did you know that there are direct flights from Accra to Rome? Isn’t that awesome? And the flight is only just over 5 hours. When as Australians we are used to 24+hrs to Europe, it’s just such a thrill. So, after our short flight, and about 2 hours sleep, we headed straight to Roma Termini train station, and boarded a fast train to Venice. Exhaustion was temporarily overcome by the sheer prettiness of Venice, the crazy thrill of all that water, and the gratuitous joy of being back in the developed world. 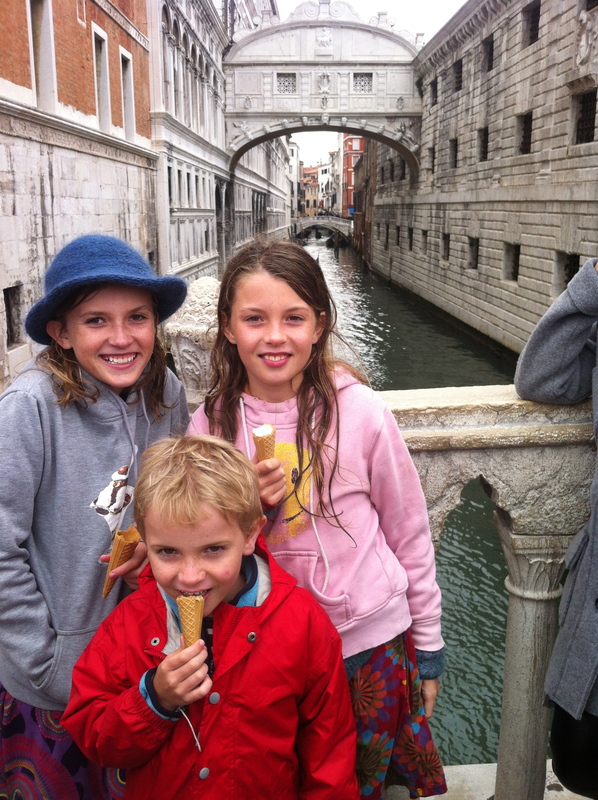 The Bridge of Sighs, and gelato. It was welcoming cool (cold even! ), but a little damp. We wandered the streets, and stared open-mouthed at it all. We ate gelato, we ate pizza, we ate pasta. I sold a kidney and we took a gondola ride, and amazed at how gently the gondolier steered the boat through the narrow back canals. 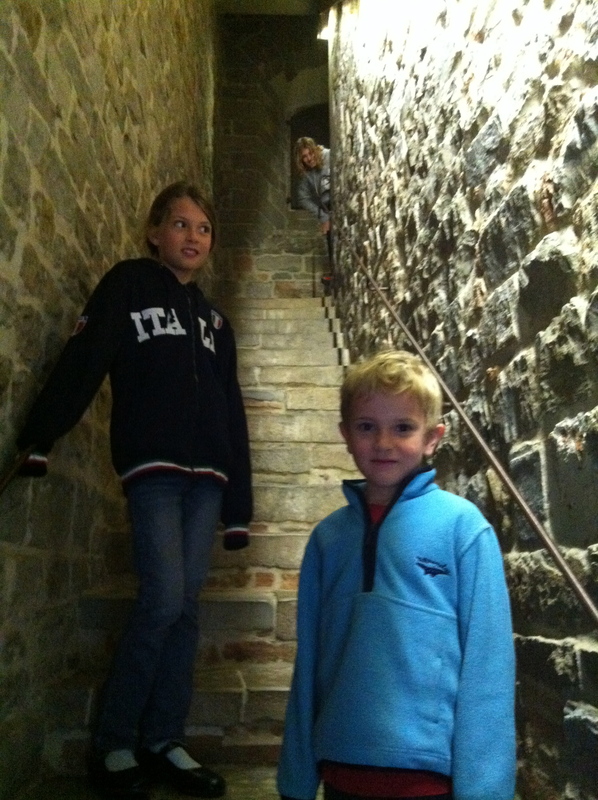 We climbed bell towers. As a last minute decision, we caught a water bus to Murano, the glass blowing island. And really, it was the surprise hit of the holiday. The children loved watching the glass-blowing demonstration; the paper bursting into flame as it was touched to the still hot sculpture; the glass balloon shattering as it was blown and blown. Jock even considered changing his long term plans for becoming a blacksmith, to being a glass-blower. For the record he has come back to the more “useful” (his word) profession of blacksmithing. And I managed to score a beautiful vase; justified by being 50% off, and doing my bit to help the Italian economy. 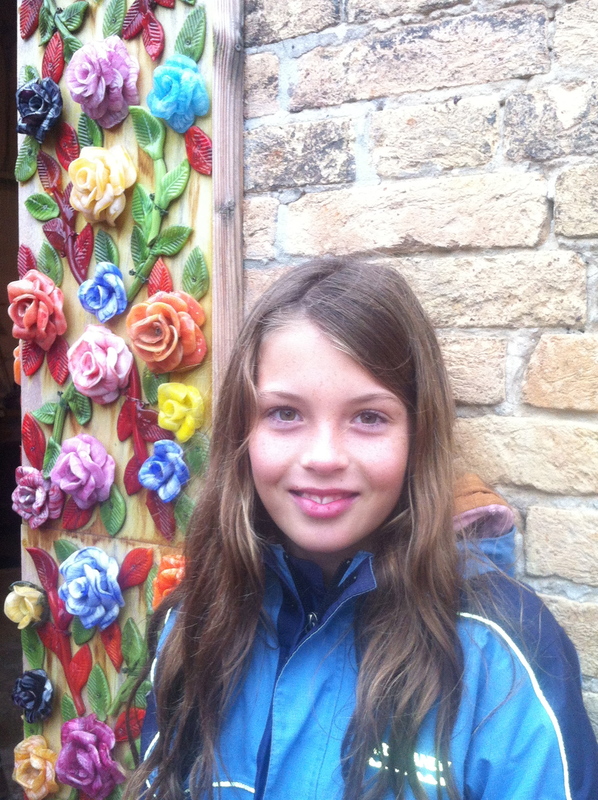 Lill and some beautiful glass flowers, Murano. 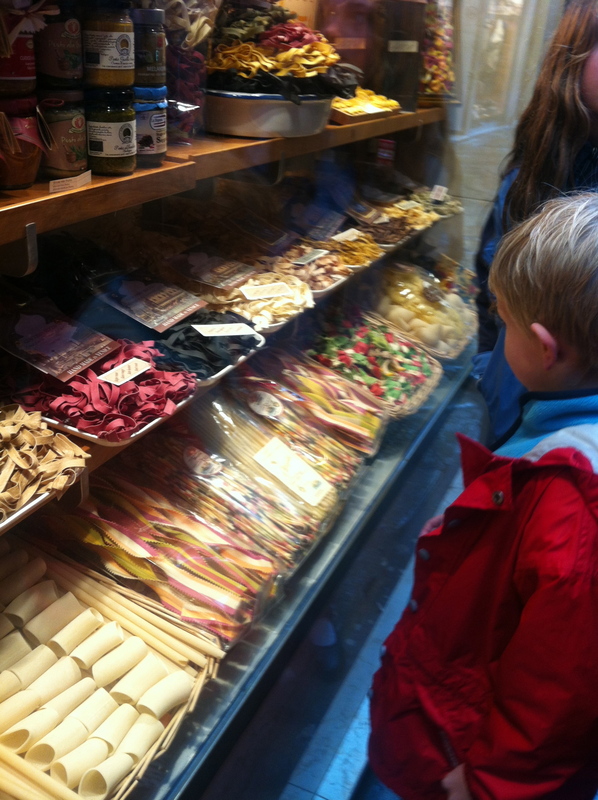 Pasta shop, as pretty as any lolly shop. When you travel, do you play the game of wondering what it would be like to live where you are? I’m chronic for it. Economic and life realities aside, isn’t it great fun? Which area would you choose to live in? Where would be your local coffee shop? I love it. And I almost always feel I can live somewhere. Alas, Venice, for all your beauty; left me feeling a little disoriented. But you did made me feel a whole lot better about the rising damp issues in our Australian house. Putting my rising damp issues to rest, San Marco’s Basilica. We’re here. Really, really here! Happy days. I’ve been wanting to go to Florence since I was a teenager, crazy, absolutely crazy, about the film (and book) Room with a View. So, my teenage plans of running away to Florence with Julian Sands didn’t involve being there with 3 children, and no Julian; but I still loved it. We made bad jokes along the lines of “There Arno rivers prettier” [the river in Florence is the Arno]; we survived the 6000 Madonna and Child paintings in the Uffizi (most importantly, the six year old boy survived them); we wandered over Pointe Vecchio and ate the best gelato ever (me: cottage cheese and pear, followed up with mojito. The kids were more traditional and stuck with lemon, chocolate and strawberry). And, the stair climbing continued. 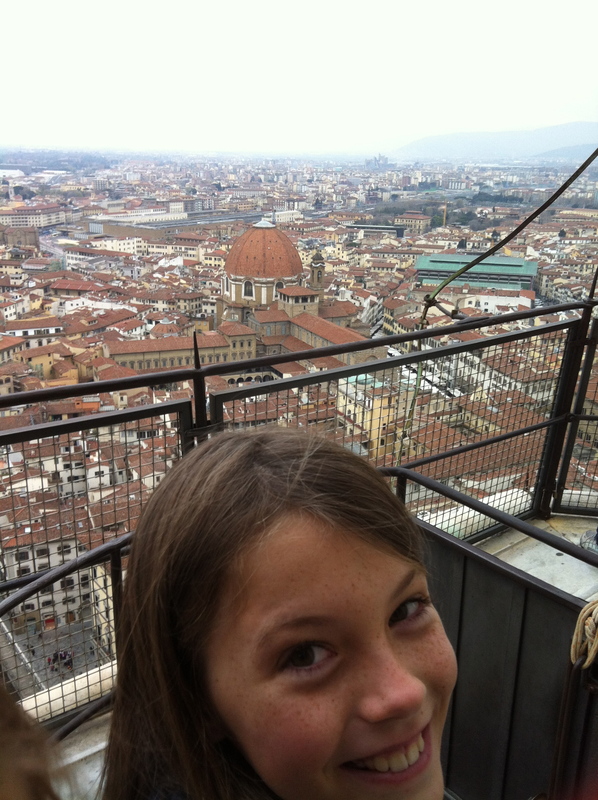 We climbed the campanile and the Duomo; the tower at Palazzo Vecchio, and imagined throwing hot oil down on invaders. 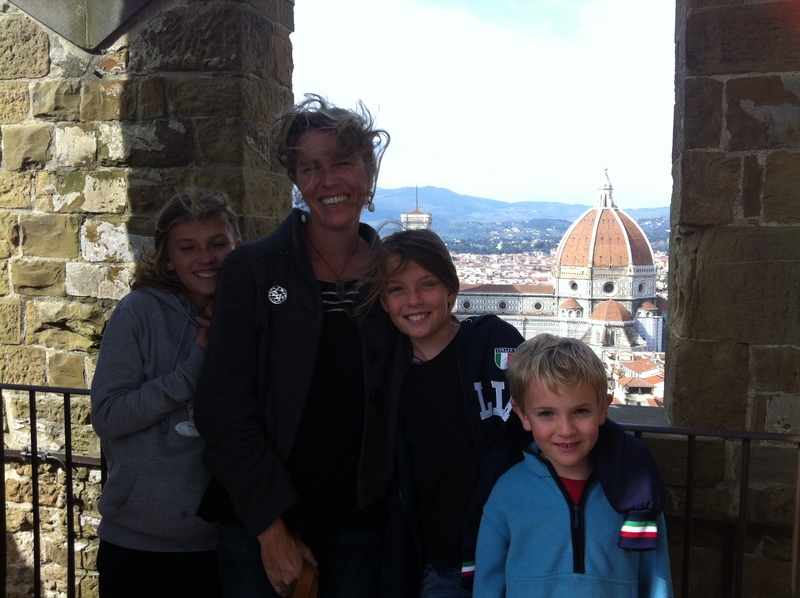 We all loved the ‘story’ of Florence; it was great for the children to see the Medici treasures of the Uffizi, then visit their ‘apartments’ at Palazzo Vecchio; and then stare in open mouthed wonder at the ‘Chapel of the Princes’. The wealth, power, and (let’s be honest) the corruption of a family was unbelievable. Another day, another tower to climb. This is the tower at Palazzo Vecchio, Florence. Yes, more climbing. Inside the Duomo. 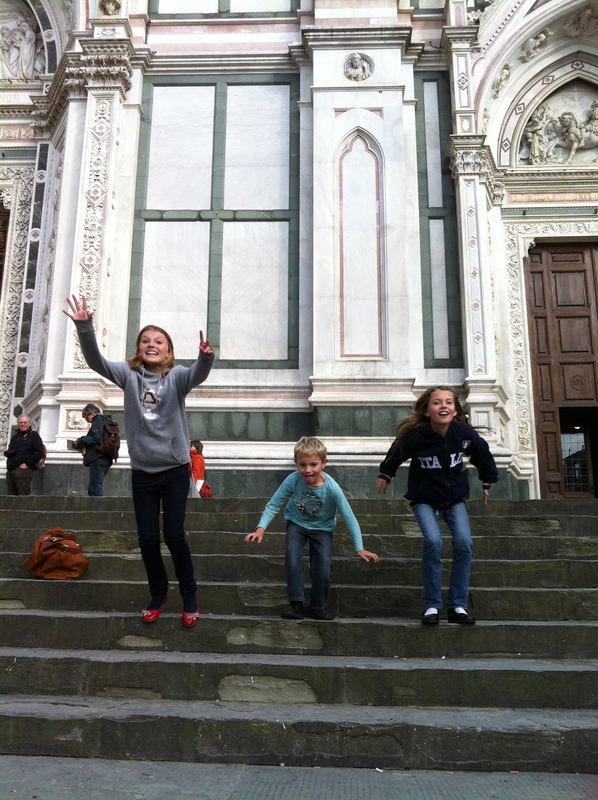 Burning off some of the gelato, Santa Croce. We loved the paper stores, and the girls obsessed about feather quills and emerald green ink (Harry Potter fans indeed). Jock loved wandering the streets the finding new towers he planned on climbing. Florence is a city I could live in. Like tomorrow. And then Rome. I had foolishly expected a kind of upmarket version of Athens. And no offence Athens, I really do love you with all my heart, but I didn’t expect Rome to be so beautiful; beautiful architecture, beautiful fountains and squares, and of course beautiful churches. And I think Kumasi traffic had prepared me for the wildness of the roads. All of that history, I now understand why it is rightly called the Eternal City. Our girls are crazy for ancient Greek gods, so it was a very logical progression to Roman gods. Indeed, in the ancient parts of Rome, they were brilliant tour guides. I was constantly asking; who was the Greek equivalent, of say Minerva (Athena). 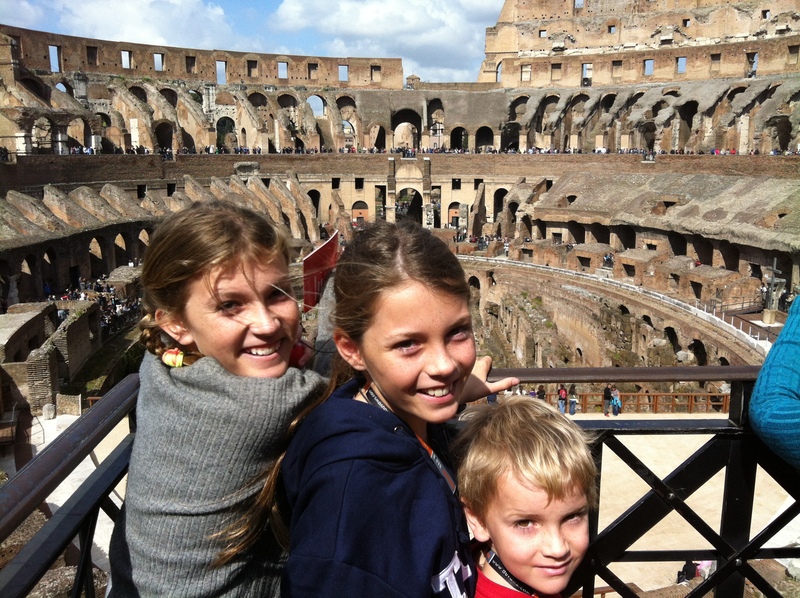 We visited the Colosseum and with audio guides plastered to our ears, soaked up all the shocking gore of it all. Sustained by gelato alone; we wandered around the Roman Forum; our brains overloading with information. Amazed, really amazed, at the amount of ancient ruins left behind. 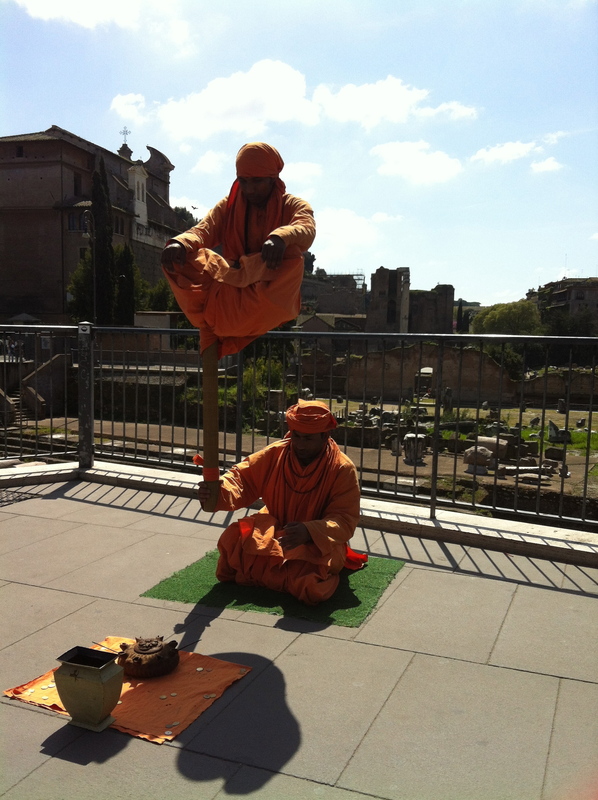 Some Indian Magic beside the ancient Roman Forum. What a multicultural world we live in. And when our brains were full; we just wandered the streets. I can’t tell you how much we love just looking at all the beautiful things, looking at the shops and all the excessive choice and prettiness of the ‘stuff’ in the developed world. Now, that sounds really shallow, but its the truth. I responded with a wry laugh when the children commented that they could build perfect stairs 2000 years ago in Ancient Rome, but they still struggle to do that at a major store in Kumasi. 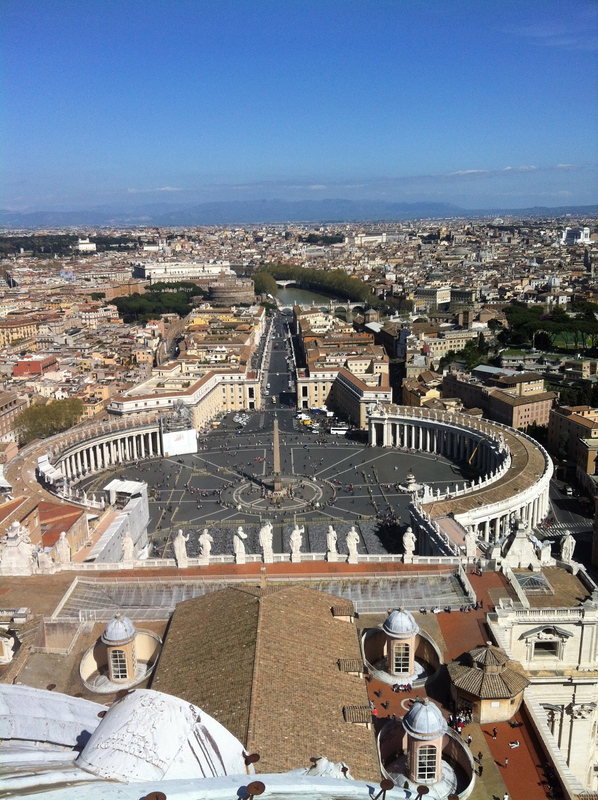 View from dome of St. Peter’s Basilica. We wisely left a full day for the Vatican. Bill had told us it was awe inspiring, but I thought I’d seen lots of very beautiful churches, and while I’m sure it was amazing, it wasn’t going to blow my socks off. Well, I was wrong. It blew all our socks off. Brain overload was taken to a whole new level. And we’re not even Roman Catholics! 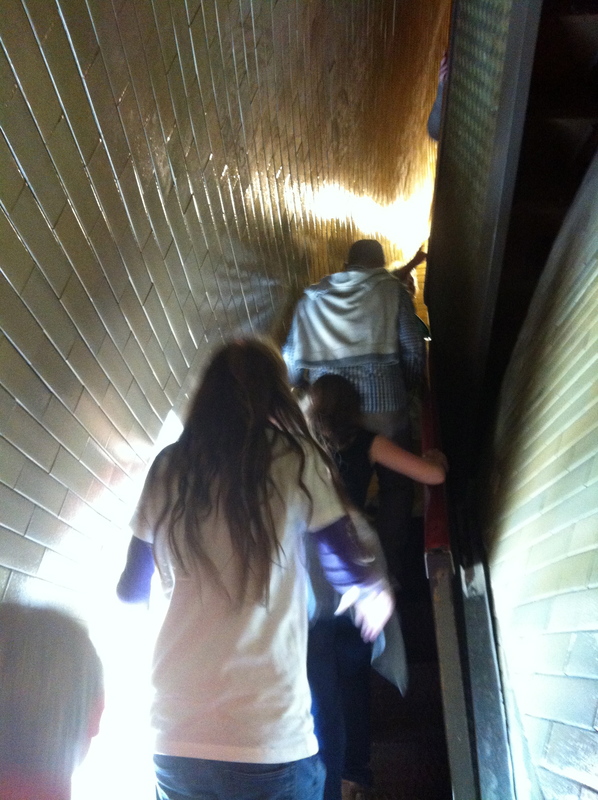 We joined the throngs of people in the Vatican Museum. We followed a Children’s trail audio guide to highlight the special treasures of a place packed with treasures. 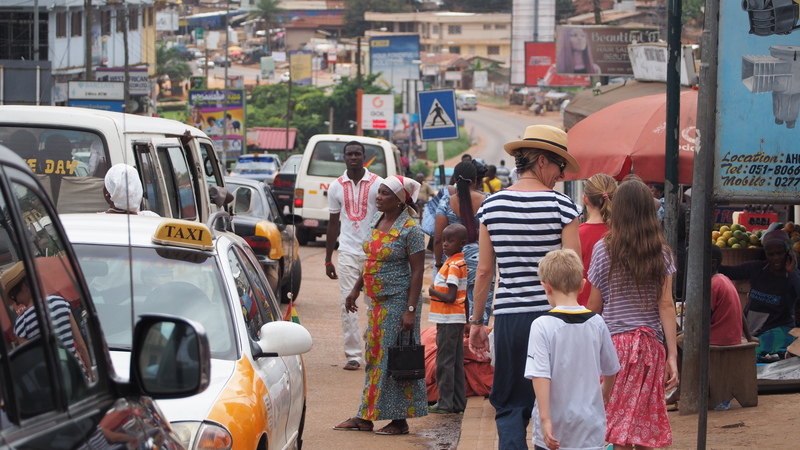 Travelling with children, particularly solo, can be a challenging business. Combining that with trying to lend a sense of perspective and time-scale is really hard. I am going to write a separate post on our successes and failures on travelling with kids, but I really want to give a big shout out to those museums which take the time and effort to make a children’s tour. Kids don’t really care about what school which painter belonged to. They want to know some cool details. Like cannons being melted down to make statues and artists going mad in the process; like when you take the Remus from Romulus and Remus, and combine it with Lupa, the she-wolf who mothered them; you’ll get Remus Lupin. Hello Harry Potter. They want it to be a bit funny; a bit gory; they need to be reminded that the people who made these treasures were just people too. So, a big thanks to the Vatican Museum, whose rooms and corridors of treasures could have been brain numbing; but was fun and relevant. But back to the Vatican. After the museum, we walked back to St. Peter’s Basilica; whose enormity even dwarfed the crowds at the entrance; and the queues moved quickly. Light streamed through the windows above the aisle, and even for a cynic like me; there was a very real sense that this was a holy place. And the opulence of it all, again, was mind blowing. 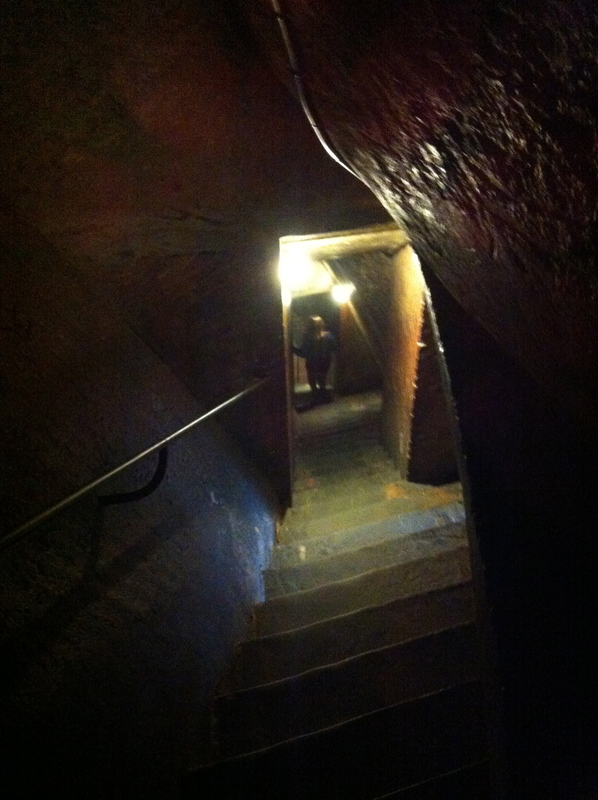 While our necks were aching from staring up, Jock was kneeling down, peering through brass vents on the floor. 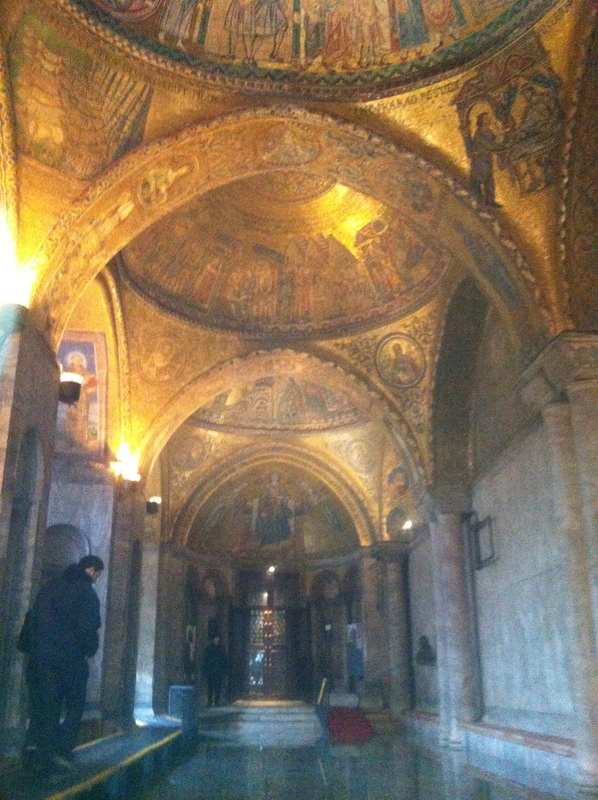 He could see equally opulent corridors a level below where the priests would walk to get up to the altar. 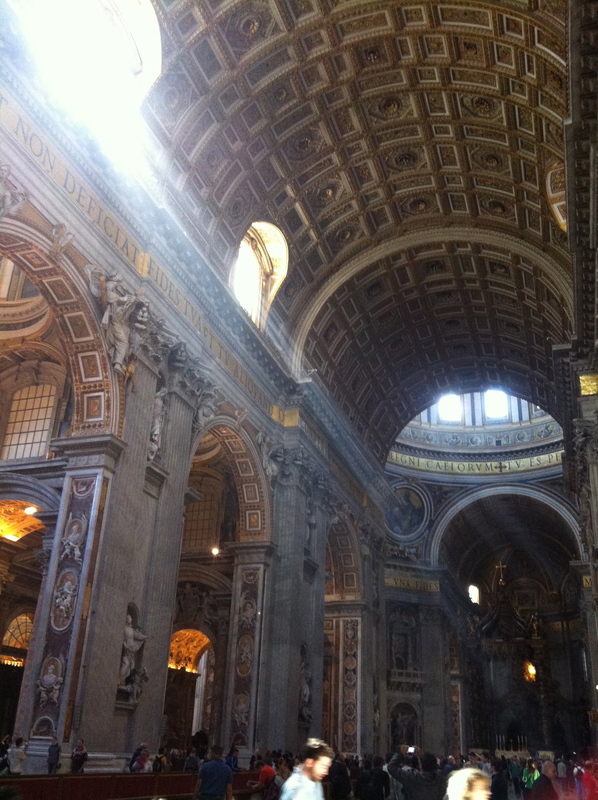 Another dome, this time inside St. Peter’s Basilica. 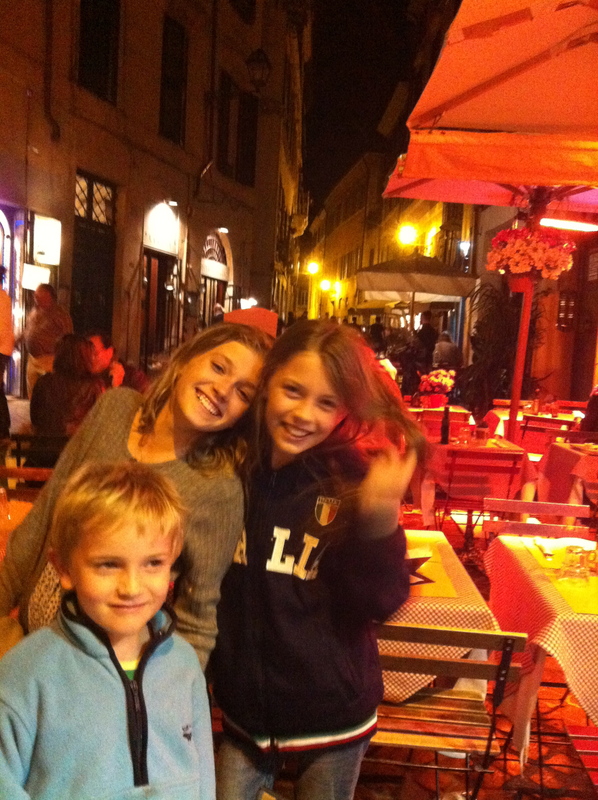 Living it up in Rome. 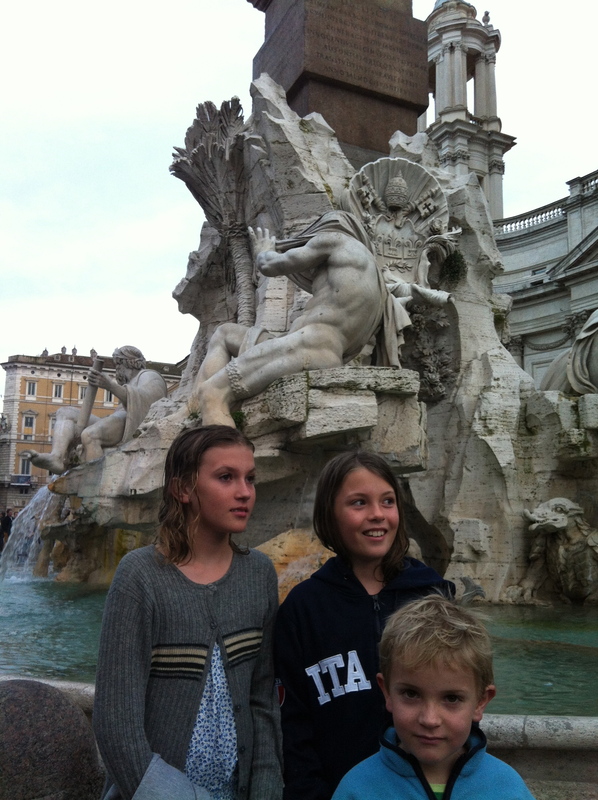 The fountain of the rivers of the four continents in Piazza Navona. Standing in front of ‘Africa’ whose head (the Nile) is covered, as the source of the Nile is not known. The girls are watching police chase off street vendors. Before we knew it we were eating our last gelato at the airport; with suitcases stuffed full of cheese, pasta, wine, prosciutto, artichokes (!) and fresh milk (!!). Hey, it’s only a 5 hour flight and no Australian quarantine to deal with. And before I go, I’ve got a question for you, it’s been bugging me for years. Why do we call cities and countries by their anglicised names? Why do we call it Rome and not Roma? 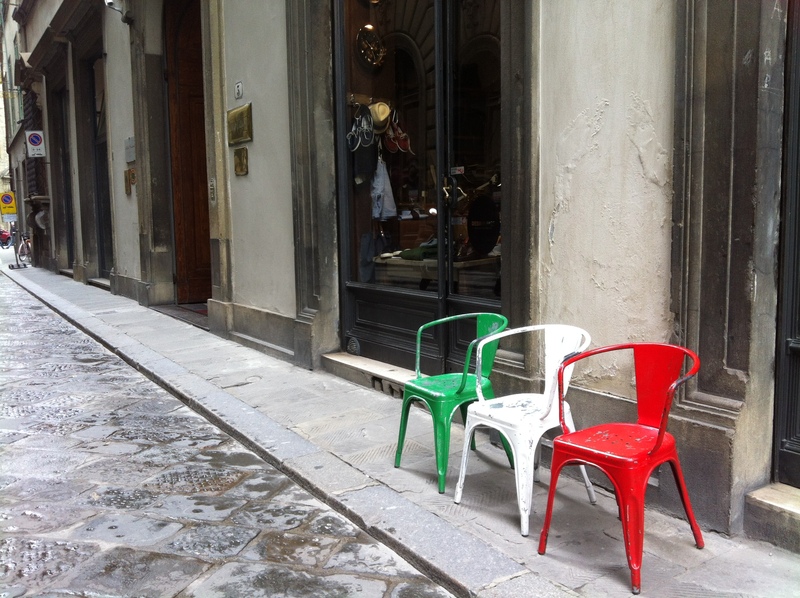 Why Florence and not Firenze? Why Venice and not Venezia? But Sydney is Sydney, and Paris is Paris. Indeed, why do we call a whole country by a different name? Why do we call it Japan and not Nippon? Why Greece and not Hellas? Don’t you think it’s odd? I’d love an answer. With Fruit…..Why do we call an orange by it’s color a orange..but we don’t call an apple a red or a banana a yellow or a pear a green….i mean where is the Constant flow..
Why do we call a group of buildings that are already built, buildings?…….they should be called builts or maybe even build. Hi Chrissie. It’s wonderful to hear your news and to see how much the children have grown! I’m interested in your musings about why we translate place names into our own languages. I think this is something that we all do no matter what our mother tongue is. When we speak English we use the English version of the word, so Rome for Roma or tomato for pomodoro. Paris (or Parigi as the Italians call it) is a completely different word in English and French; it just has the same spelling but wildly different pronunciation. France and Sydney are similar examples. I think at the end of the day all names and place names are translated, but some of them (especially those that are easily pronounced by a foreign tongue) are closer to the original than others, but they are never really the same. Hi Chris and thanks…did you use a new camera or change your settings? the photos are fantastic and, and your descriptive analysis was dead on. Hi Don, Thanks for your comments as always. With your high standards of photography I take that as a real compliment; but you would be horrified if you knew what camera I was using it Italy. Let’s just say we packed very light and the camera name started with an “i”. Let’s give credit for the photos to the lovely European light, and some very happy kids. Your descriptions about your holiday was so picturesque,I felt I was there. You’ve saved me a lot of money and days on a plane getting there that I feel I dont need to make the journey anymore. Looks like a lovely trip. I visited Rome & Florence in high school but I’m dying to get back to Italy. Joe & I are constantly questioning why we used anglicized names – it gets far too confusing. My name is Jay in every language, I’m not sure why we don’t do that for countries & cities too? Hi Jay. Now that you are in Europe, all I can say is get thee to Italy! It was such fun, and would be awesome to spend a romantic week there with Joe. And yes, weird about the names of places. No one has suggested a reason, I guess its just one of those weird things. 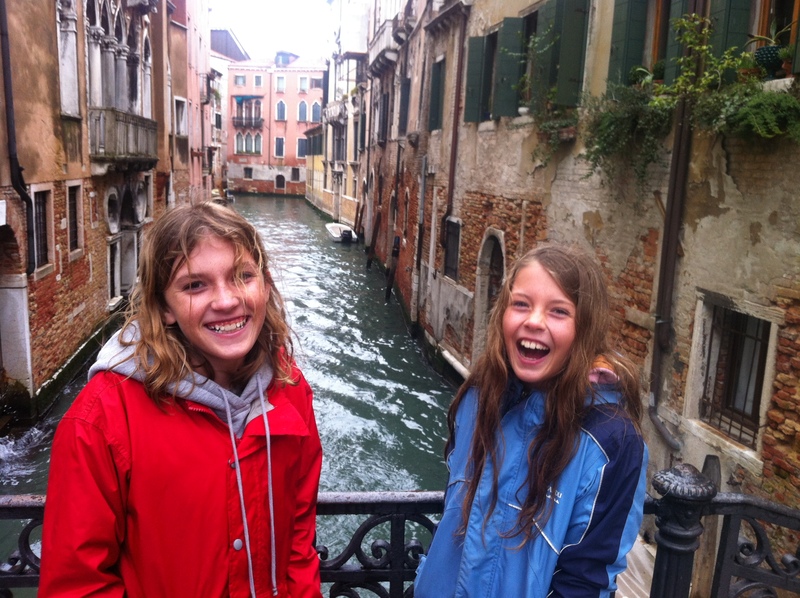 When in Italy, my daughter Cecily was called Cecilia (with the ch C sound), we both loved it!